Into Zynga Poker? Want a bit o’ artificial intelligence to tweak-up your game play? Then meet your new buddy, PokerBuddy Pro that is. The PokerBuddy team spent nearly two years perfecting algorithmic and statistical analysis for no-limit Texas-Hold’em. The result is a Windows-only software client that provides players advice, in real-time, throughout their game play. In case you’re wondering, no it’s not limited to Zynga Poker, this is just the first implementation. Using PokerBuddy Pro is quite simple, all you need to do is keep it open alongside your Zynga Poker window, and just follow its advice. It will keep it coming as it continuously updates its hand-play recommendations based on assessment of hole cards (your hand), the flop cards (top facing cards on the table), the number of cards dealt, and pot size. How does it gather this data? Good question. All I was able to get out of CEO Alex Frenkel is that evidently it’s not all that difficult to do using deep level of communication protocols. You need to understand that this wasn’t the major challenge as there are many ways to integrate, this includes reading the chat, scraping from the screen and more. Legally we don’t see any problem as well because it is not a bot , it won’t play for you! Here’s where PokerBuddy’s truly compelling features come into play. Hand Rank – After a player is dealt the first two hole cards, PokerBuddy rates the hand against the overall deck, and provides a percentage indicator of how many possible hands the player’s current cards gives them an advantage over. For example: An Ace of Clubs with a 7 of clubs is statistically better than 88.1% of all other possible hands. Once top facing cards are dealt (the “flop”), the Hand Rank lets you know exactly what your highest current hand combinations are (two pair, Flush, etc.). Your Stack – This is the number of Big Blinds (potential bets against the current high bid) that you have left so you can plan your betting strategy accordingly. After the flop, this indicator switches to let you know how many cards left in the deck can improve your hand, also known as ‘Outs’. To make things even easier for players, PokerBuddy deftly integrated game play aggressiveness levels in the form of characters who act as ‘advisors’. These range from the more conservative ‘Edward Bailey’ (The Hold’em Professor), to the mid-road ‘Karen Brown’ (Brown Sugar), to the most aggressive advisor ‘James Ford’ (Young-Gun Ford). When it’s time to act, the advisers’ backgrounds will change to yellow, allowing the player to click on any one of them in order to get their advice on the current hand in play. Interestingly, the PokerBuddy team has limited real-time advice at five hands per game. Their logic behind this decision was not to hurt the game or give unfair advantage to any of the players. Also, the team noted that they will gladly adjust this should Zynga ask them to. Post action feedback (after the player made a move) is unlimited because the decision was made and the feedback has no effect on the results of the hand. There’s one additional part to PokerBuddy Pro and that is its website. The site acts as a sort of social data locker where players can track their results and performance. 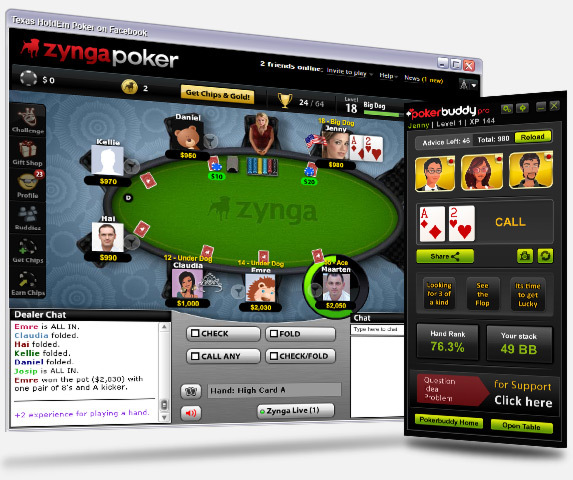 For players that take their Zynga Poker more seriously, this is a big deal because Zynga Poker doesn’t provide game logs, so the only alternative is to video record a game session. A social envelope on top of the data allows players to discuss game play with others. All-in-all a great way to learn and improve your game play. How does PokerBuddy aim to make money? Quite simple really… They plan on selling credits for real-time advice. At the moment advice is free to all, but the company plans on turning on for-pay advice in the coming months.